Inset Email: From Trump associate Felix Sater to Trump Organization EVP Michael Cohen during the 2015 Republican pesidential primary. Spoiler alert: it’s NOT Fake News. The TrumpRussia scandal is incredibly complex and allegedly involves real estate deals, global finance, money laundering, organized crime, “kompromat,” espionage, politics, and otherwise. Unsurprisingly, it’s incredibly difficult for ANYONE to get one’s head around this story. Moreover, the onslaught of media bombshells about TrumpRussia has intensified to a truly dizzying pace. Indeed, just over the past day, three TrumpRussia bombshell stories were reported by the “failing” New York Times and the “Amazon” Washington Post. What do these latest media bombshells tell us? And how do these stories tie back to the infamous “Steele Dossier”? Yesterday, the Washington Post published a bombshell story reporting that, while Donald Trump was running for President, he was negotiating a deal to build a “massive Trump Tower in Moscow”. That’s right, the guy who vehemently denied having “any dealings” with Russia throughout his campaign was actually in the midst of negotiating a MAJOR real estate deal in Russia. In fact, Trump’s company went so far as signing a legal “Letter of Intent” with a Russian company for the Trump Tower Moscow project. Trump’s Russian partner for Trump Tower Moscow was Aras Agalarov, an oligarch who paid $20 million to bring Trump’s 2013 Miss Universe contest to the Agalarov family’s Moscow concert pavilion, Crocus City Hall. Right after the 2013 Miss Universe pageant, Agalarov had secured financing for 70% of Trump Tower Moscow from the Russian bank, Sberbank. Agalarov’s pop-star son, Emin, along with his agent, Rob Goldstone, helped arranged the Trump Tower meeting in early June 2016 (the infamous “Russian Lawyer Meeting”) between Donald Trump, Jr., Jared Kushner, Paul Manafort, and Kremlin-connected lawyer Natalia Veselnitskaya, along with a Russian cast of characters, including notorious “former” Russian counterintelligence officer and hacking expert, Rinat Akhmetshin. 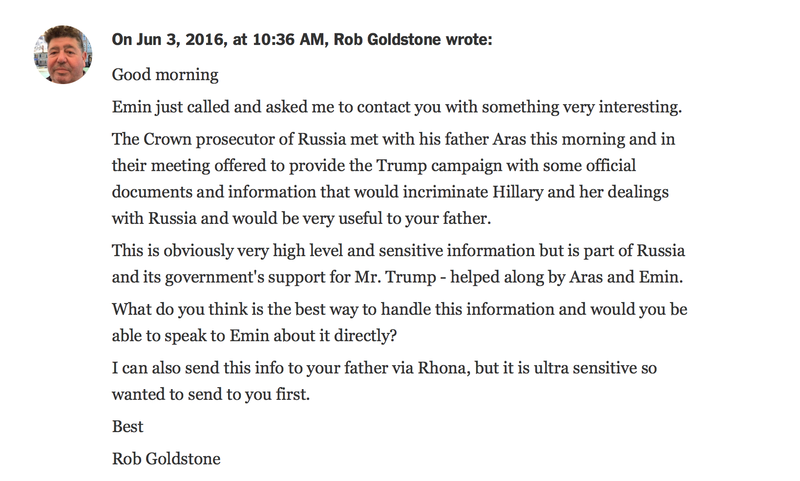 According to emails from Goldstone to Don Jr, the purpose of the Russian lawyer meeting was “to provide the Trump campaign with some official documents and information that would incriminate Hillary and her dealings with Russia and would be very useful to your father…(as) part of Russia and its government’s support for Mr. Trump — helped along by Aras and Emin.” However, Don Jr maintained that they only discussed adoptions, which is generally understood to mean the U.S. sanctions on Russian individuals. Today’s bombshells added even more fuel to the TrumpRussia fire. Another report by the Washington Post confirmed that Donald Trump himself signed the letter of intent for Trump Tower Moscow on October 28, 2015, over 4 months AFTER launching his presidential campaign. Despite Trump’s self-proclaimed deal-making acumen, the Moscow project had stalled by January 2016, prompting Trump’s lawyer, Michael Cohen, to reach out directly to the Kremlin. Specifically, Cohen emailed Dmitry Peskov, the Kremlin’s spokesman, to request his help with the Trump Tower Moscow project. And then later today, things went from bad to worse for Trump, with the New York Times report of multiple emails written by Felix Sater. Sater, a former business partner of Trump, is a Russian-born American, who was convicted of multiple felonies and became an FBI informant, while at the same time, he and his company, Bayrock, allegedly laundered Russian oligarchs’ money into real estate in the United States. So to recap: Vladimir PUTIN put his spokesman, Dmitry PESKOV, in charge of Russia’s dossier of kompromat on Hillary Clinton. Trump’s laywer, Michael COHEN, emailed PESKOV about the stalled Trump Tower Moscow project. This Trump Tower Moscow project was partnered with Aras AGALAROV, whose son, EMIN, along with his agent, GOLDSTONE, arranged the Russian Lawyer Meeting in Trump Tower, ostensibly so that Russia could share its kompromat on Hillary Clinton. And on the side, Trump’s former business partner, Felix SATER, sent multiple emails to COHEN promising to enlist PUTIN’S help with the election. After all of the denials by Trump and his associates of ANY involvement with Russia, we are supposed to believe this is all just a “coincidence”? This article was originally published by Dr. Dena Grayson on Medium.com on August 28, 2017. Next Impeaching Trump is all about Bob.